This report provides an analysis of the current and suggested legal framework that could regulate CCS activities in Sweden and the wider Baltic Sea region. The evolution of a well-functioning legal framework for regional CCS operations is expected to be time consuming, with the early identification of potential hurdles critical to all stakeholders. 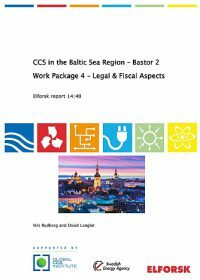 David Langlet was commissioned by Elforsk to analyse legal and fiscal aspects of CCS in the Baltic Sea region. The study was carried out jointly with Nils Rydberg who brought expertise on the CCS value chain and its actors. 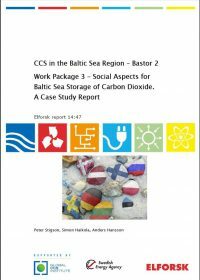 This report is part of the project Bastor2 (Baltic Storage of CO2), with the overriding objective to assess the opportunities and conditions for CO2 sequestration in the Baltic Sea Area. The project, which ran from June 2012 through September 2014, was financed by the Swedish Energy Agency, the Global CCS Institute and a number of Swedish industrial and energy companies. Carbon capture and storage (CCS) has been highlighted in many countries and regions as a vital measure needed to reduce our greenhouse gas emissions in the fight against climate change. The technical and commercial development has been impeded by projects and project plans facing opposition by different groups. Against this background, this report describes the results of a study, within the BASTOR2 project, analyzing which social factors are likely to influence the plans for a proposed Baltic Sea storage project. As there are not yet any CO2 storage projects in the Baltic region, the analysis for this report has been carried out on three Swedish case-studies of other energy related projects in the Baltic Sea. The social research literature consistently points to local and regional contexts as having a large influence on the perceptions and acceptance of CCS projects. The report consequently highlights a number of contexts, or conditions, that are identified as important factors in how the case-studies have been perceived and accepted or opposed in the local and national context. 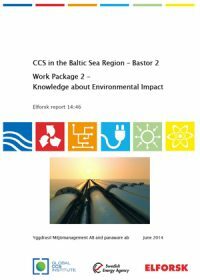 The objective of this study is to document current knowledge, hazards and risks on environmental impacts in a possible future CCS project in the offshore Baltic Sea Area. Another purpose is to also present a tentative EIA work plan for a field trial project as scoped out in Chapter 2. Further, the intention is to add new knowledge, if possible, to what is already known or applicable to CCS activities in the offshore Baltic Sea Area. Yggdrasil Miljömanagement AB, together with panaware ab, were commissioned by Elforsk AB to document current knowledge about environmental impacts in the light of a possible CCS field trial project in the offshore Baltic Sea Area. This report is part of the project Bastor2 (Baltic Storage of CO2), with the overriding objective to assess the opportunities and conditions for CO2 sequestration in the region. The project, which ran from June 2012 through September 2014, was financed by the Swedish Energy Agency and the Global CCS Institute in collaboration with a number of Swedish industrial and energy companies. 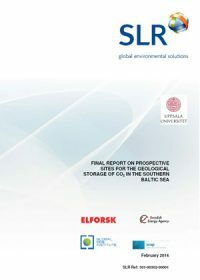 For this study, SLR was commissioned by Elforsk to identify and characterise the potential CO2 storage sites in the southern Baltic Sea, in a project sponsored by the Swedish Energy Agency, the Global Carbon Capture and Storage Institute and Swedish industrial partners. The study determined that there is a theoretical regional capacity to store some 16Gt of CO2 in the Middle Cambrian sandstone beneath 900 metres of caprock and 1.9Gt in the Dalders Monocline. There is theoretical storage capacity of some 743Mt CO2 in hydrocarbon and saline structures, which are located mainly offshore of Latvia. On the basis of the data available, there is no effective capacity proven within these totals, although the Dalders Structure, with 128Mt, could be considered better defined, albeit still within the theoretical category range. Thus the study has established a relatively large theoretical storage capacity for captured CO2.